Many people find the swim leg of a triathlon the hardest (and thereby their least favorite!). And we aren’t just talking about amateurs here; many professional triathletes also admit that the swim leg is their most daunting. It makes sense, open water swimming makes triathletes face challenges that they would not face in a pool. Choppy waters and no guiding lanes are just the most apparent ones. Another major (but less apparent) challenge that you face in open waters is the increased fatigue. Why Do You Get Tired When You Swim? Although stamina does play a big part in the swim leg of a triathlon, you have to remember that swimming in open waters uses a lot more energy than in a pool. Additionally, there are no breaks from your swim strokes in open waters as there are no walls to push off from every time you take a lap. Consider this to give you an idea of what a big difference this makes: when you swim in a pool, you would normally swim about 20 strokes at a time before pushing off from the wall, an Ironman swim would consist of about 5000 uninterrupted strokes! Concentrating on these five factors during your triathlon training swim workouts will make a difference no matter if it is your first triathlon or your fifth and they will help even if you are training for a mini triathlon or half triathlon. After all perfecting your technique will take you a long way regardless of distance. This one is on top of the list because you can’t expect your body to expend energy it doesn’t have. You’ll be amazed at how much you sweat during a long distance swim and keeping yourself hydrated should be a priority. Drink a lot of fluids between your training sessions and before and after your swimming leg of competitions. You also burn an immense number of calories while swimming so make sure you eat a diet with plenty of whole grains, vegetables and lean protein to provide your body with the energy it needs. Consult a nutritionist if necessary and have a look at our blog 6 Nutrition Tips for Beginner Triathletes for overall nutritional tips for triathletes. As any seasoned swimmer will tell you, breathing while swimming is completely different than breathing while on land. Not only do the right breathing techniques provide your muscles with the oxygen they need while swimming, but they also help you stay calm and focused when fatigue and mental stress start to set in. Keep your face in the water. It keeps your body in the right position to reduce drag and make movement efficient. Exhale under water. This takes some practice but once you get it right, you’ll see what a big difference it makes. 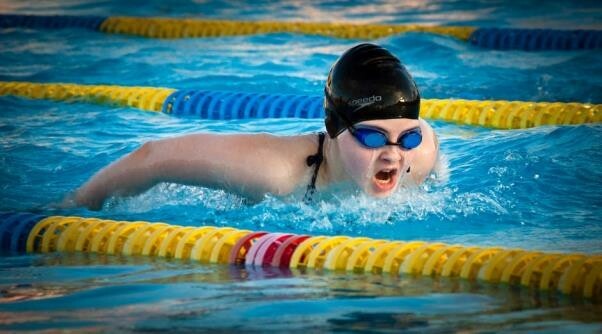 Holding your breath when your face is under water is a common mistake many beginner swimmers make and it’s easily rectified with a bit of practice. Breathe in when you turn your head. “Swim Long” is a term you’ll hear many a time while training. This means keeping your body flat and horizontal and focusing on using your lead arm to extend your bodyline. Shorter arm pulls mean more effort and therefore more energy being used. Avoid a high swinging lead stroke. If your hand enters the water at a steeper angle and closer to your head, you can use your weight shifts and body rotation to your advantage. Concentrate on your kick. A common misconception is the harder you kick the faster you’ll swim. In fact, it’ll just tire you out before your bike and run legs of the race. A narrow kick will keep your body in alignment and facilitate your rotation. Longer strokes mean you’ll cover more distance per stroke so swim smarter not harder. Your gear can make a big difference to how tired you get. A triathlon wetsuit or tech suit that does not fit well can increase drag and hence require you to use more energy than necessary. Make sure your swimming googles and other triathlon accessories fit and function the way they are meant to. If you’re uncomfortable in your gear, it can not only adversely affect your performance but cause mental fatigue as well. So test out any new gear during your training sessions before the big race.